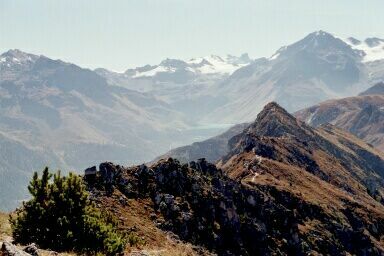 High above the Rhone valley, near Sion lies Nendaz (www.nendaz.ch). 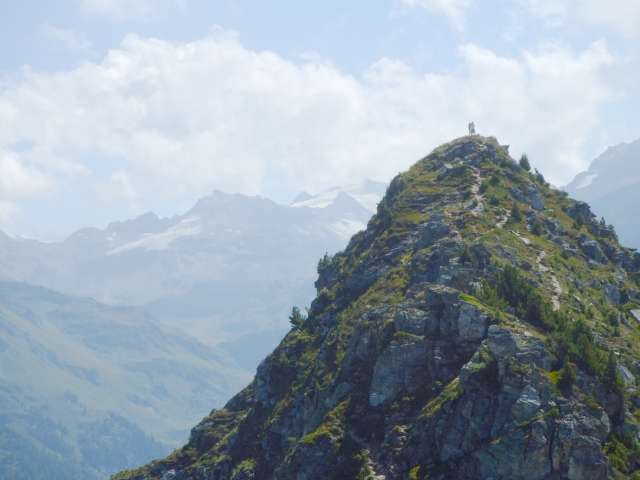 In winter time a large Ski resort with reliable snow conditions, it's slopes connecting with the ones between Verbier and Veysonnaz, the region offers lots of opportunities for hikers as well. There are connections by Postauto to Sion. Suonen: The "Bisse" are old water channels ( some older then 500 years) used for cultivation. Some lovely hiking trails run directly along those channels. 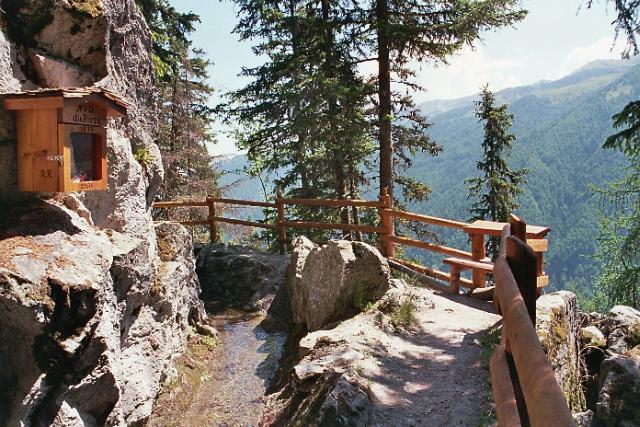 Bisse Vieux to Bisse du Milieu: On this easy and lovely route we're crossing alpine forests and meadows. Bisse de Saxon: With 32 km (20 Miles) it's the longest of the water channels and it runs on an altitude of about 1700 m.
Bisse de Chervé: The former Bisse is now a fantastic hiking track on a altitude of some 2000 m.
Bisse de Vex: The renovated Bisse is again carrying water from the Printze river to Mayens de Sion. 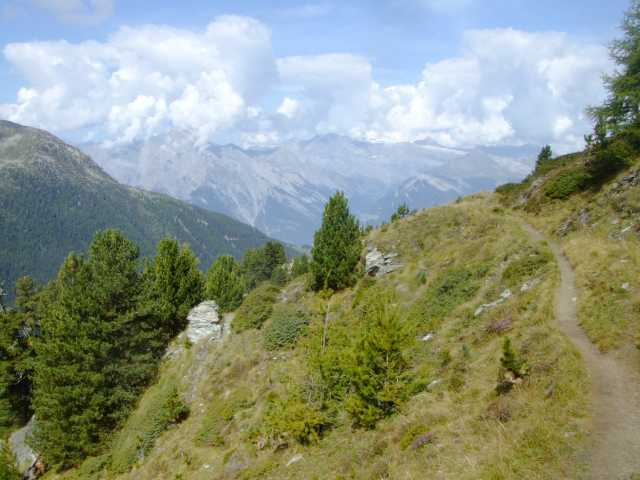 The combination of Bisse Vieux and Bisse de Vex makes a lovely Hike from Nendaz to Veysonnaz. Dent de Nendaz: Superb view pays off the climb from Tracouet. Siviez - Tracouet: A fantastic hike along the rim. 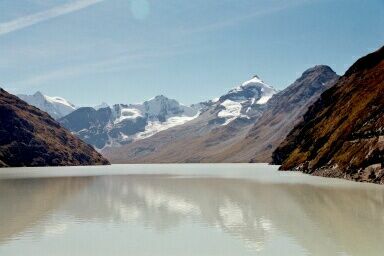 Grand Dixence: The technical masterpiece with the giant dam is an excellent starting point for hikes. The Sentier des Pives (pine cones hike) is an excellent introduction into the environment and reaches the old Bisse de Saxon. Pfynwald, Bhutan bridge: This area in the Rhone area is a nature park with primeval pine trees (scots fir), little lakes, rare plants. In the hike included is the hike up to the "Bhutan" bridge, a suspension bridge over the impressive "Illgraben", a deep cut ravine. 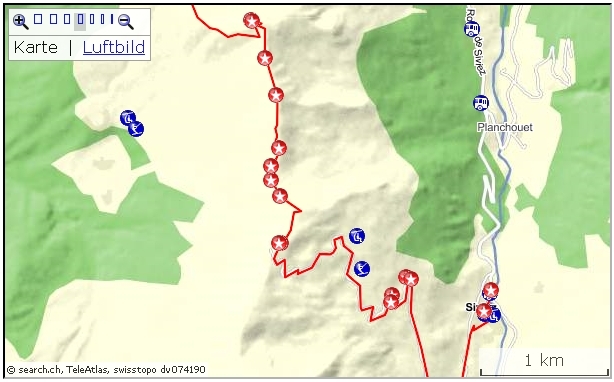 Interesting for hikers is the fact, that tracks along the "Bisse's" have moderate slopes. The Tourist office provides interesting brochures and information. Especially helpful is the booklet with Number 2: "les bisses/die suonen" of "Walliser Wanderwege" (German/French). Publisher VALRANDO: info@valrando.ch. It contains explanations about the Bisse's, panoramic views, height profiles, times, Bus stops, Restaurants. 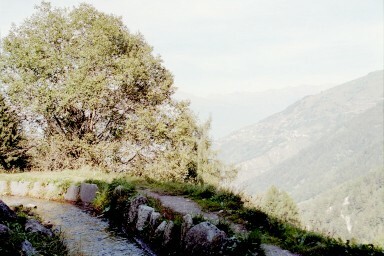 The Bisse's in the region of Nendaz and Veysonnaz draw their water off the river Printze. 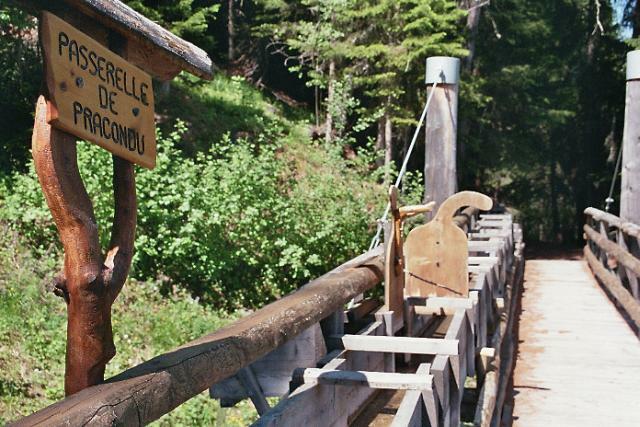 We begin our tour near the lower end of the Bisse vieux (constructed before 1658), at the Wanderweg sign some 800 m on the main road from the cable car station towards Iserable. After a few meters we're on a field track, to the right water murmurs in its channel. The houses above and below the Bisse are getting fewer and fewer, finally we're in the forest. Steadily moderately ascending the path runs through shady trees, bypassing alp meadows. Here and there we get a view over to Nendaz, later Veysonnaz. After about two hours we're at the Postauto stop in Lavanthier and the friendly little Restaurant "Vieux Nendaz". Back to Nendaz we choose the track along the Bisse du Milieu (constructed 1700). From the Restaurant we're on the road to the left down to the river Printze. Some 200 m after crossing the bridge another Restaurant is inviting. The track along "our" Bisse is not explicitly mentioned on the signs (although "Bisse de Vex" is). A track descends down to the Printze. We cross the river on the footbridge. The Bisse de Milieu is clearly visible and marked, but no name is mentioned. We'll be passing the places where the water for the Bisse's is being tapped. Quite interesting. Along the enjoyable track we'll also pass some creeks crossing the line of the Bisse. Precautions have been taken to protect the Bisse from damages by high-water. After about 1.5 hours we're back in Nendaz. Built 1865-1876 and in use until 1965, this is a very long Suone. 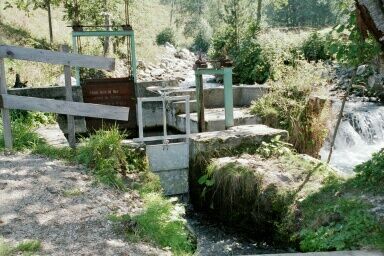 As water source again it's the river Printze in the Siviez region in about 1850 m that guarantees a regular feed. 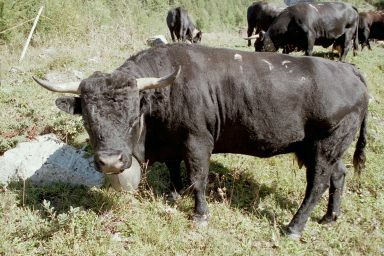 The Bisse almost surrounds the Dent de Nendaz. In some parts the channel had to be hewn into rocks, in other parts abysses were crossed on stilts, in some places stone walls were built. The sheer length made it necessary also to build three huts for the caretaker...One is rebuilt at La Bourla: set right over the Bisse. Although the water channel is not in use anymore, the old track is still recognizable and in many places carefully renovated, so we can admire the will and the cleverness of the people 150 years ago. 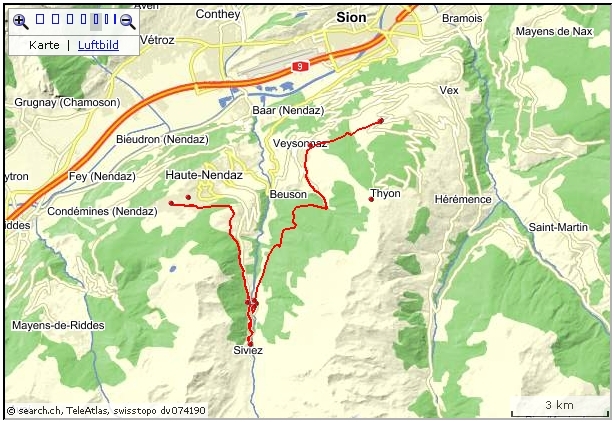 I found the tour Nendaz - Tsablo Plan - Le Bourla - Siviez, then back along the Bisse Vieux (see above) extremely interesting. 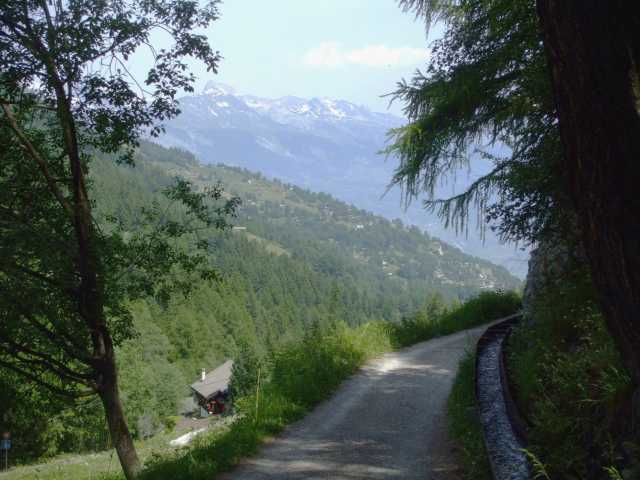 Since the latitude of the line is between 1800 and 1700 m we have first to climb some 500 m.
As start I chose the "Wanderweg" turning off the Bitumen road from Nendaz Station (the cable car station to La Tracouet) to La Peroua. The narrow path begins some 500 m after the Cable car station. Another 500 m and the easy walk along the Bisse Vieux is over and the fairly steep ascent to Tsable Plans is on. Partly we're on Bitumen road towards some of the newer Chalets (some still under construction), partly we're crossing alp meadows. Later we're walking up on a forest tracks. A view into Rhone valley, or across to the Diablerets gives enough excuses for taking a short break now and then. Arriving at alp Tsablo Plans the old, dry Bisse de Saxon doesn't impress much; that will change. We're now on a very comfortable track along the old water carrier. 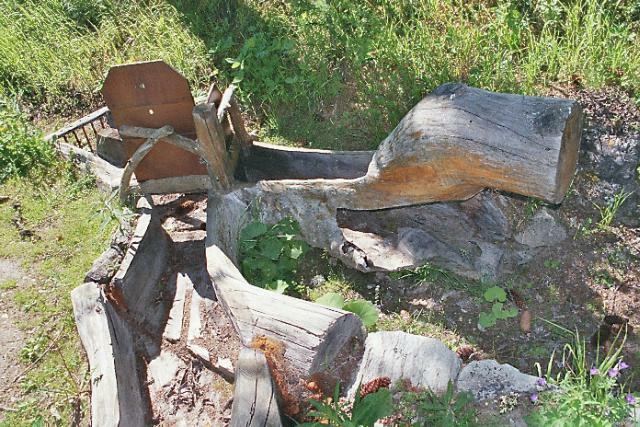 Adapted to the surrounding and available material, the channel consist of ditches, stone walls, wooden boards. La Bourla with the hut for the overseer makes one think about that guys job; in horrible weather -and all alone to fix the demolished Bisse as quick as possible!? Later we're passing rocky areas, were the Bisse is cut into rock, or fenced by a stone wall. The track is now getting narrow, sometimes trailing under overhanging boulders. From Siviez there is track along the Printze. 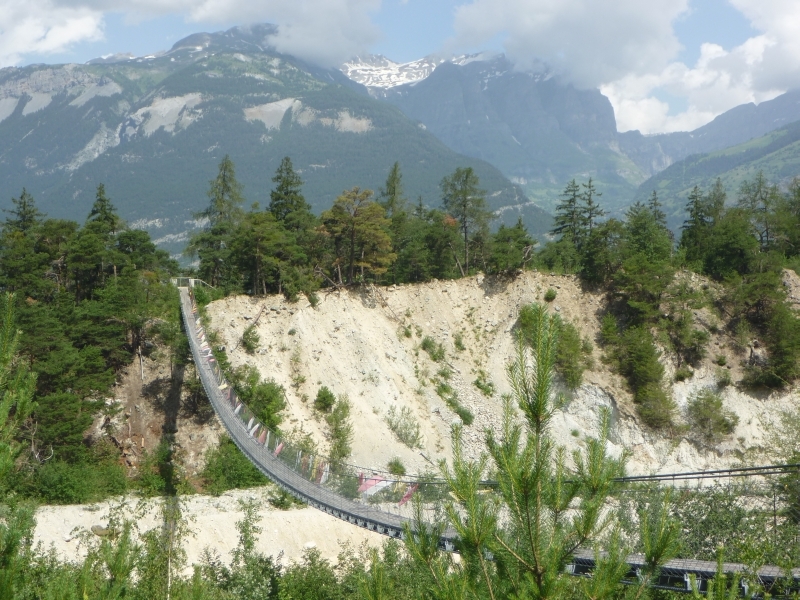 The "entry" to the Bisse Vieux is some 20 Minutes on the left of the Bitumen road down to Nendaz. 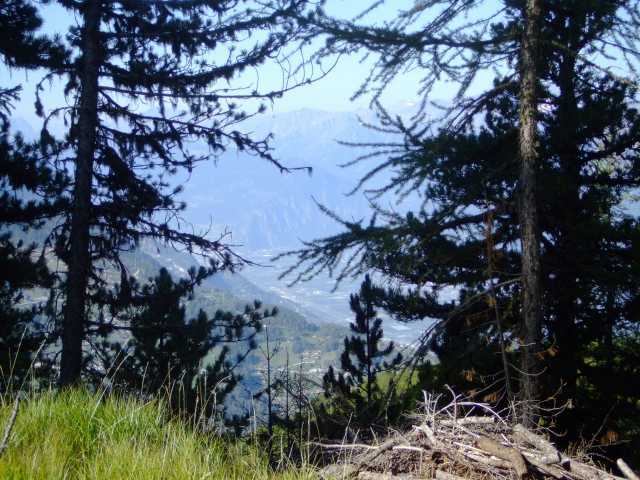 Walking the "other" way towards Iserable and Mayens de Riddes, from Nendaz to Pra da Dzeu - La Dzora, one is awarded with a lovely and easy Hike too (but first there is again the ascent to the altitude of the Bisse). In La Dzora a longer part of the Bisse is gone. A track circumventing a critical part of terrain (in June 2005 the road to Mayens de Riddes and the hiking track were still covered with meters of debris) will bring you to the last part in Le Rosey to the Bisse above Mayens de Riddes and Saxon. The Bisse was constructed in 1862. With an altitude between above 2000 m it's one of the highest, - and especially the first two thirds especially attractive. Siviez (Postauto) - Lac de Cleuson - Thyon (cable car to Veysonnaz) (5 hrs). The first part is more or less along a ski lift, crossing alpine pasture and walking in the proximity of brooks and pines. The climb up to the dam of the lake Cleuson is along a zigzag track and bit steeper then the other sections. At the dam in the little church there is a board, remembering the eleven men who died between 1943 and 1950 because of an accident while working on the construction site. The Bisse is somewhat higher then lake Cleuson. In the main season a chair lift Siviez-Combatseline is in operation. This Bisse (constructed in 1453) draws her water just below Planchouet. A starting point, only in the main season, is the Bus stop on the road to Siviez (Bifurcation Planchouet). From the crossroads we have to descend on the Bitumen road to the Bridge, then across the Printze river and ascend on the other side. A board on the left of the road gives some information. After passing the two Restaurants along the road the Bisse finally is appearing, sometimes in a pipe, later in a channel, at other places open, as it used to be. 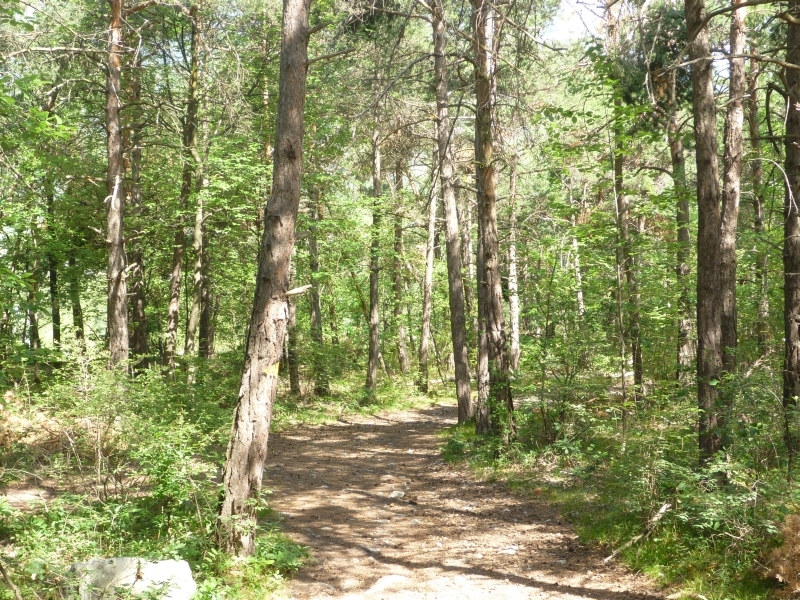 The walk along the Bisse de Vex is pleasant, for the most part in the shade of forest trees. 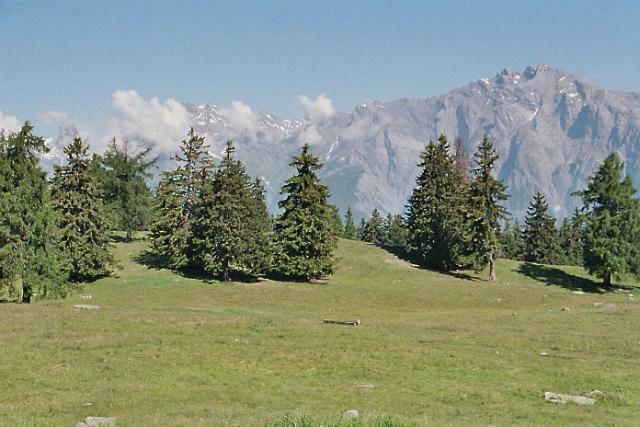 Before entering Veysonnaz, traversing open grass land, the view stretches over to Nendaz and in the distance the mountains with the Haut de Cry. In Veysonnaz the Bisse trail proceeds passing the cable car station to Thyon 2000, some Restaurants, the Tourist office, then goes on towards Mayens de Sion. 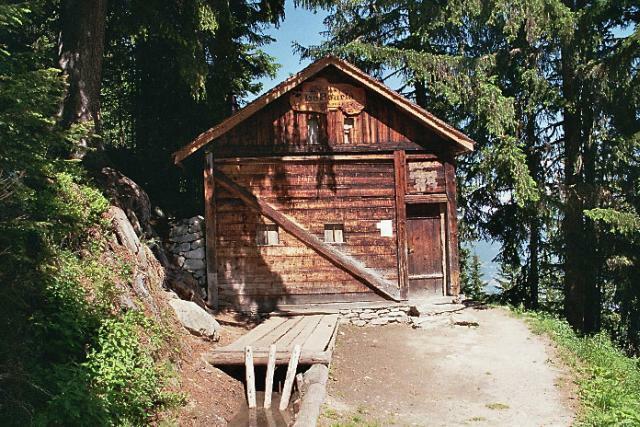 The Bus stop is some 100m from the Tourist office towards Veysonnaz village. The final section, for the most part, is again on a lovely forest track. 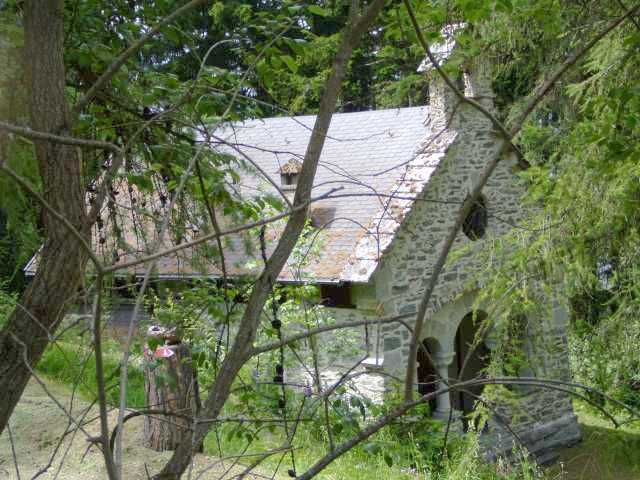 Some 800m before the end, we reach the Protestant chapel. After 100m there is a Bus stop and the Bitumen road to Mayens de l'Ours (check time table). Hint: walking up towards Mayens de l'Ours, the "ancient Bisse d'Heremence" is close by. An excellent combination, the walk along the two Bisses is easy walking, mostly in the shade of trees, with many beautiful views. a 50 m walk and crossing of main road between the two stops. This 3 hrs hike provides an insight into the environment and the developments of the region. In Tsablo Plan, at the old Bisse de Saxon, the system of collecting and distributing water is explained. The track is marked by wooden signs with a pine cone or with the name of the track. The first "post" is in the area of the sport track "Vita parcours". The blue sign for that track is visible right at the main road from the Tourist office to the cable car station, on the left, when the main road makes a sharp bend to the right. After the introduction, there will be 10 more posts with explanations in French, but Brochures in English and other languages are available from the Tourist office. For Tracouet, the start for the ascent to Dent de Nendaz, we may use the cable car Nendaz-Tracouet. 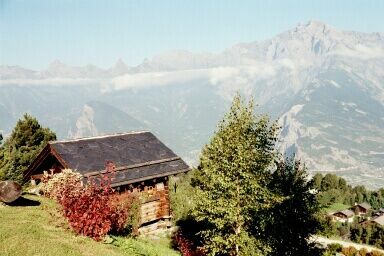 While ascending, the Bisse de Saxon can be seen from the windows of the cable car. 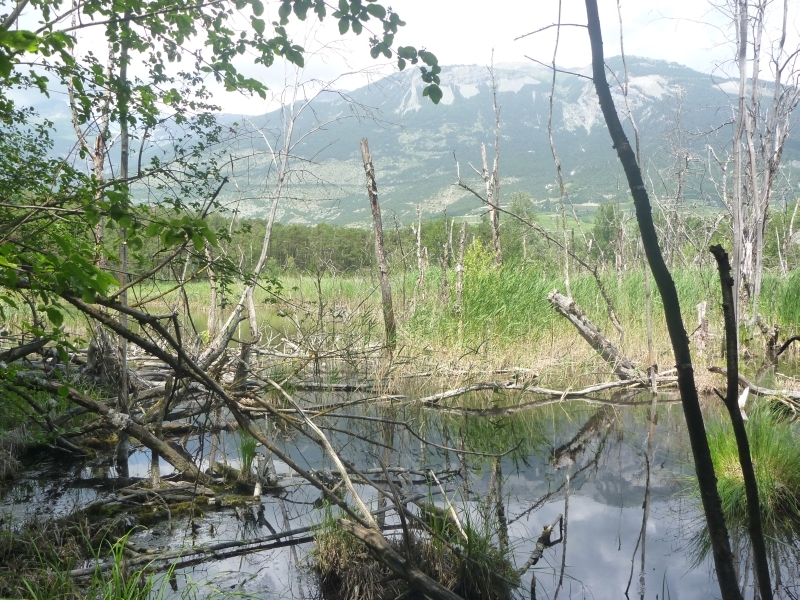 In these area the water in the Bisse flows inside wooded channels. From the station atop with the little lake a mountain track runs to the Dent de Nendaz with a splendid view (90 min return). 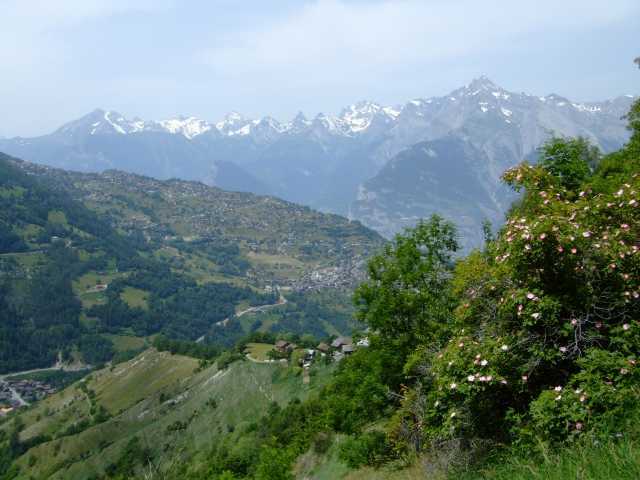 From Tracouet and Dent de Nendaz are many options for longer or shorter hikes. Remarkable is the tour over the mountain rim from Dent de Nendaz to Siviez/Super Nendaz (near Lac Cleuson). (La Peroua - Tracouet 2 hrs). The track at La Peroua (Bus stop) is smoothly ascending in the woods. 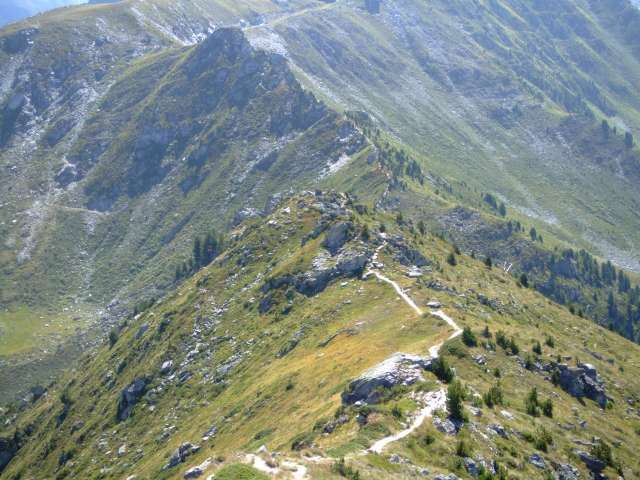 The Sentier des Pives uses the same route. At Pra da Dzeu, after crossing the old Bisse de Saxon, we follow the path to the Croix de Jean-Pierre. 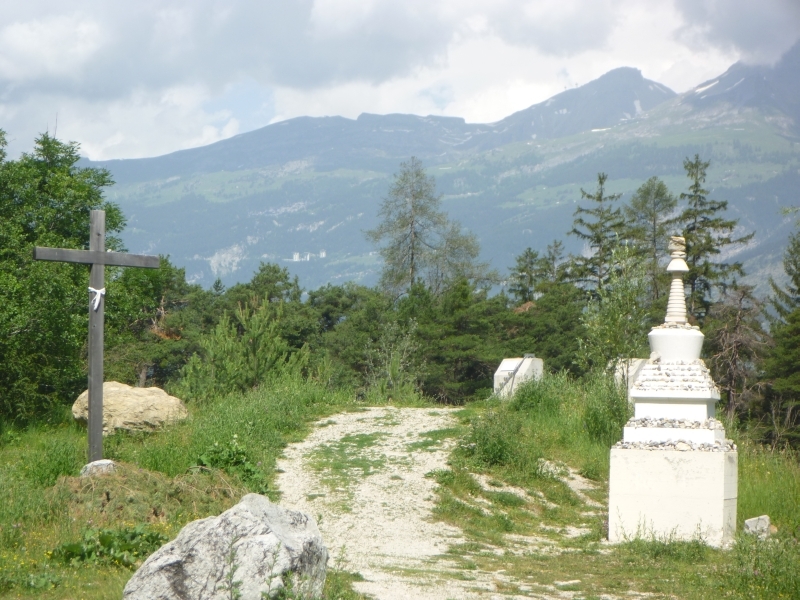 From here at the spot with three Christian Crosses, a steeper trail will get us up to the Tracouet cable car station. The track to the Dent de Nendaz is clearly marked (90 min return). Siviez (Super-Nendaz) - Plan du Fou - Le Basso d'Alou - Pointe de Balavaux - Dent de Nendaz - Tracouet. I started the tour at the Postauto stop. (A track would start just about where the "Bisse the Saxon" route is leaving the woods, right above Siviez). Shortly after passing the Skilift area and sport center, a track leads to the gravel driveway. This road will bring us up to Plan de Fou, it's the maintenance road for the Skilifts. There are some shortcuts as well, some marked, some not. At Plan du Fou with a Skilift from Siviez and a cable car from Balavaux/Prarion a grass track brings us to the rim. (There is also a dead end grass road that ends a few meter under the rim). From now on, we're walking in the sky, on a pretty narrow track. Quite often some rock climbing is needed. Spectacular views are guaranteed. Just do either walk OR enjoy the view! At the peak on point 2428 a rock wall has to be descended. The installed rope is pretty welcome. The track continues, climbing over the peak of Pointe de Balavaux, then finally reaching the upper part of Dent de Nendaz. Grand Dixence (www.grande-dixence.ch/) is a remarkable site. 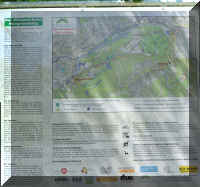 For technically interested visitors a information pavilion and documentation is available. The inside of the dam can be inspected as well. Four power plants generate electricity of about 2 GW, three of them are below surface. The lake is supplied from a wide area. The water of Lac de Cleuson (near Siviez) is pumped up to lake Dix. Four more pumping plants are in operation. With that, Grand Dixence is able to produce and sell high priced peak energy. Thanks to the development of the region, some interesting hikes in the high mountain region are now easy to get to. 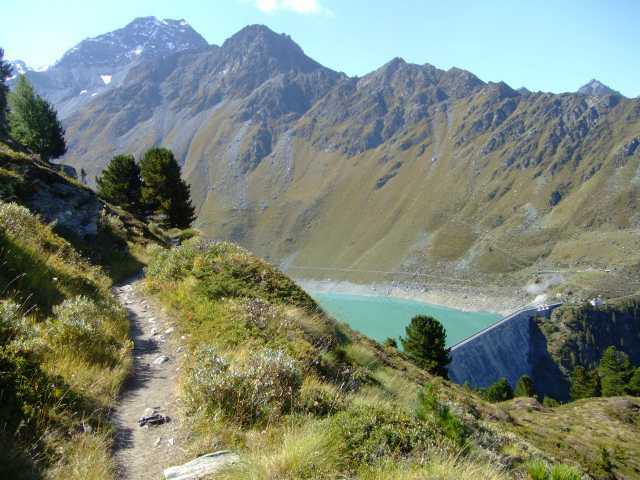 A comfortable path runs along the Lac de Dix. First a couple of tunnels have to be passed. The longest one is provided with push button and timer to switch the light on. 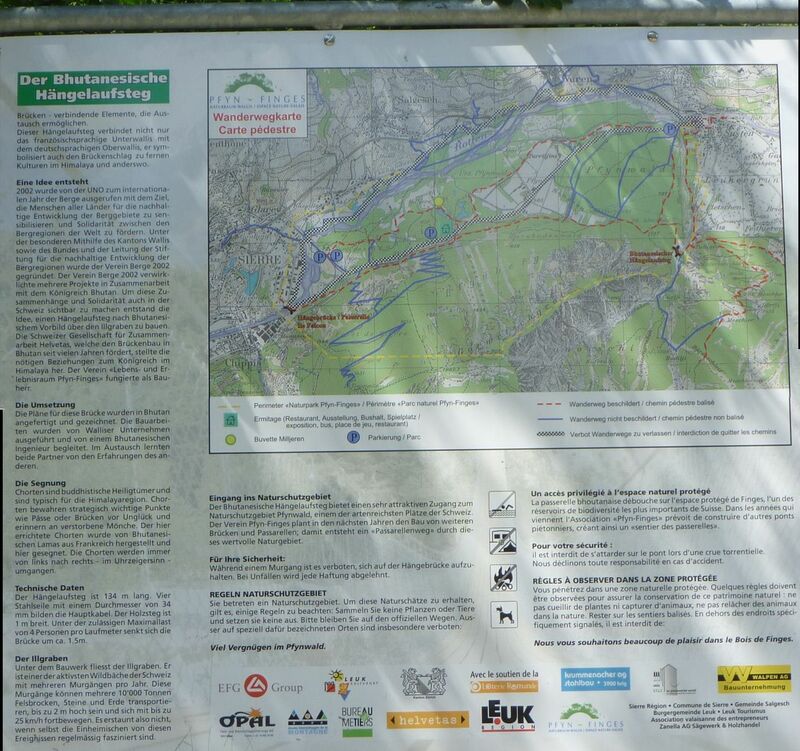 Le Sentier Bourquetas is a nature path providing 7 information post's. It runs between 2400 and 2800 m. Time needed: some 4.6 h.
On the way to Grand Dixence we cross the pretty village of Heremence. The village is well known for its modern church St Nicolas, a interesting building in concrete architecture (built 1967/71, Architect W.M.Foerderer). A visit of the church is really impressive. The building itself is remarkable, the ambience inside is special. With sight and sound effects visitors are transferred into a very peculiar situation. (4.5 hrs). The first part is a detour up to the suspension bridge. The name derives from the fact, that the construction of the bridge was a joint cooperation between Engineers from the kingdom of Bhutan and Switzerland. It was triggered by the UN's year 2002 of the mountains. From the railway station at Leuk, the route leads to the bridge over Illgraben (The rift caused by mountain creek "Ill"). Here is also the Lock from where a Canal is transporting water from the Rhone river to the power plant in Chippis. On both sides of the Illgraben a hiking track reaches the suspension bridge, so a roundtrip just to the bridge is an option (2.5 hrs). Choosing the climb on the Eastern side, we're first on Bitumen road, later proceeding on a comfortable gravel road and passing the soccer field area, later a picnic area under the pin trees. 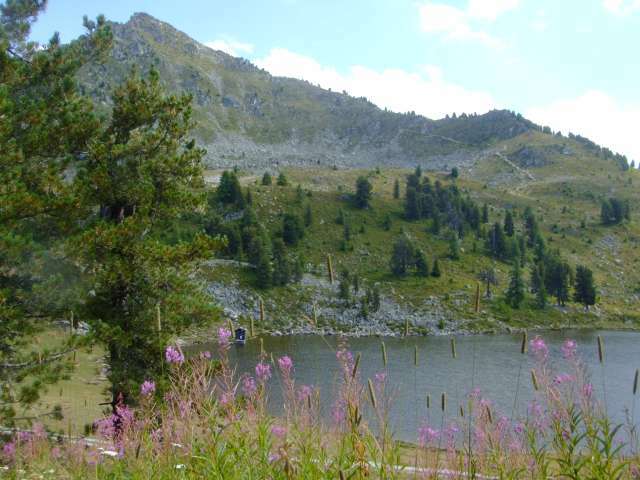 Going on, the Camping area "Bella Tola" is situated to the left. Finally, the suspension bridge is reached, some 200 m above Leuk / Susten. A Christian cross and a small Stupa and prayer flags on the bridge are reminding the cooperation of the Swiss and Bhutan engineers. Crossing the bridge gives an impressiv view over the lower part of the Illgraben. After reaching the Rhone valley plains again, the main road has to be crossed (be careful). A track is at first sight hardly visible and a sign is missing. But entering the shrub for just a step or two, the yellow sign in 30m distance to the NW can be seen, and a track as well. For the most part the terrain is flat. A creek or water channel may be on the way, the pine tree providing shade. Where the path is on the fringe of the pines it might get pretty hot in the summer time. There are also some small lakes embedded in the greenery. About 200 m after having managed the mainroad we're crossing a large water-channel which is feeding the generators of the Aluminum plant in Chippis. After a lot of "dealings" (and selling off the electric power plants) and cost for electricity for Aluminum-production have become too high (keywords: Alusuisse, Blocher/Ebner/Marchionne, Alcan, Rio Tinto, Apollo) the power plant is now property of FMV (main shareholder is Canton Wallis). 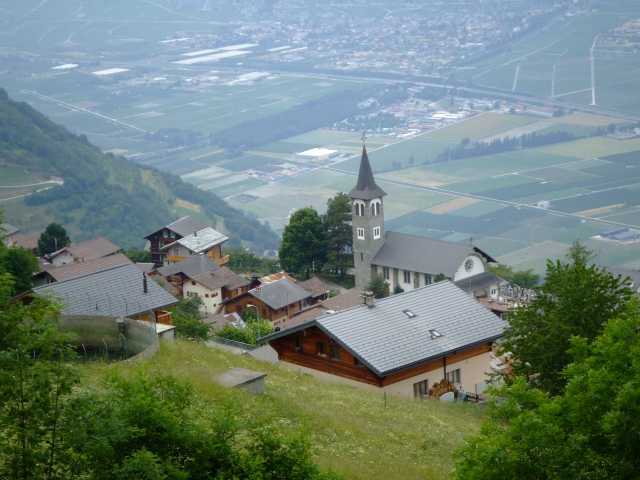 The last part, towards Sierre is in a hilly area. The Pfynwald track ends at a Bus stop "Parc de Finges" near the camping ground; walking time to Sierre railway station is about 45 Min.